What about a lifestyle plan for your child or grandchild? Here’s what prompted that question. Recently, I was confronted with no less than three lengthy articles about obesity, two dealing with childhood obesity, one with adult obesity. I was struck by the variety of publications that carried these articles: one source was the Delta Sky magazine (I was flying from Phoenix to Columbus), one was from a professional magazine, Nursing Spectrum, and the third was The Illinois Nurse. The health challenges that can result from weight issues are indeed overwhelming. Articles and books dealing with that subject abound in bookstores as well as online. The results of this challenge, then, are not the focus of this blog. Today I want to sift through the three articles and list several suggestions for dealing with weight issues with a child/grandchild. As a further observation, I believe these suggestions will also give positive results to adults. Help kids pay attention to feelings of hunger and fullness. Eat when you are a “0” and stop eating when you are ‘satisfied’ which is before you get to ‘full’ or ‘stuffed.’ Don’t let your hunger level fall below 0 (when you feel like you are ‘starving’). Smaller, more frequent meals will help to accomplish #1: remember ELMO: Eat Less More Often! Encourage consumption of USDA recommended number of fruits and vegetables (www.mypyramid.gov) currently nine servings. Eat breakfast daily. In fact, each as many meals together as possible. Limit television and screen time. Limit eating out, especially at fast food restaurants. Article will be concluded tomorrow with references. Do you practice any of these suggestions? Have you noticed any benefit to your children? I’m interested in your comments- please note them below. Thanksgiving week: what’s your food strategy for the next 7 weeks (that takes you through New Years week-end)? The food temptations have already started- that’s obvious! This Thursday is a biggie: regardless of your setting (unless you are totally alone), there will be piles of food– most of it high carbs, which means definite nutritional challenges. Remember that fruits and vegetables are carbs: yes, more nutrient dense and therefore theoretically better than refined carbs, but carbs, nevertheless. The social situations that you will find yourself in over the next seven weeks require that you decide on a plan of action ahead of time. There is a NECESSITY for a decision prior to getting to the food table! 2. Wear a sign to the family gathering that says: I am eating low-glycemic now and watching my carb intake. I’m not going to eat THAT! 3. Bring a dish that is low-glycemic, that tastes good (no need to sacrifice good taste), and that you can count on for good nutrition. You know there will be at least one healthy food choice. You might re-read the suggestions from the previous post (link to Healthy Science blog). 5. Practice portion control! Take a sliver of Aunt Mary’s excellent pumpkin pie, not a slice that is 1/6 of the pie! Make a decision ahead of time about sampling ALL of the pies available. You ALWAYS have a choice. I would encourage you to practice #3-5. You WILL feel better, you WILL enjoy the day better, and if you send me an email that you made one or more of these choices (#3-5), I will be extra proud of you! You are heading down the right path. What’s your strategy? Do you have one? Feel free to leave a comment. Thanksgiving week: the holiday timeline has started! How are you doing? If you have some responsibility, whether hosting or bringing a dish for your Thanksgiving dinner scene, check out these easy ideas from Dr. Stephen Boyd of Mannatech to notch up the “healthy level” of your day. Thanksgiving—Time for a Happy, Healthful Family Reunion Healthy Science. Have you made any healthy upgrade plans? Feel free to leave your comment. If you haven’t been into an activity habit, it can be very hard to appreciate the benefits you are missing! Let me tell you about one benefit that is typically unspoken. 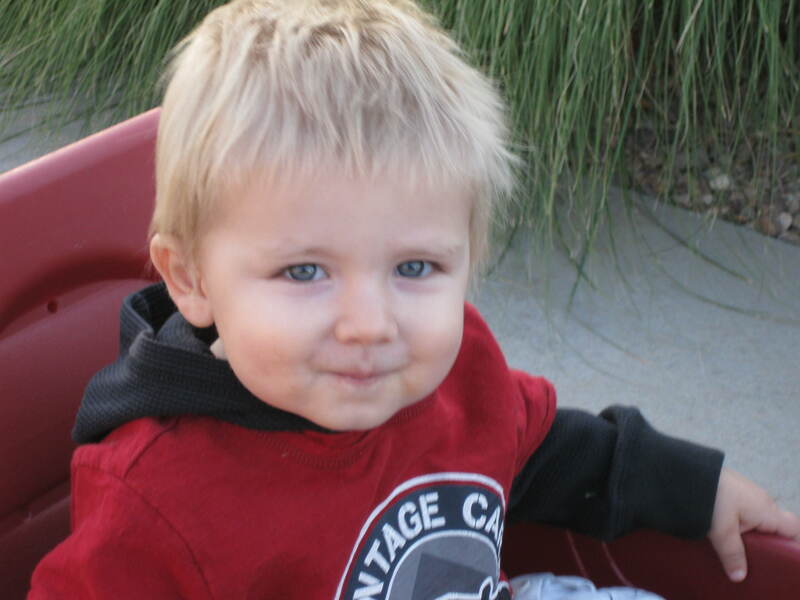 This week I am in Phoenix, visiting my grandson, Greyson (and his parents of course!). Greyson is 15 months old and constantly on the move! He is indeed a reminder that parenting- and grandparenting- is not for wimps! Good thing I’m in shape! It’s a decision I recommitted to about 6 years ago. Here’s what happened. Right after Daniel and Erin got married in July, 2004, Ed, Nathan and I took a trip that included driving through Joshua Tree National Park in CA. We pulled off the side of the road frequently and climbed the huge rock formations. As I realized the time of life that we were now entering (first son married, inevitable arrival of grandchildren sometime in the future), I recommitted to stay in shape, to be physically active, to pursue my business which would allow freedom in my schedule so that I would be able to be an involved nana wherever we lived and wherever the kids lived. What a blessed year this has been! Since Greyson has arrived on the scene in Phoenix (and we still live in Columbus), my commitment has been to see him about every two months. I am happy to report that I have been able to keep that schedule. Regular interaction between Greyson and me is a significant factor in our relationship. This visit included taking responsibility here for Greyson as his parents had their first overnight away. Greyson and I have taken long walks and played at the various neighborhood parks daily. I have gone down the slides with him; I have crawled into our homemade tent with him; I have greeted him in the morning at 6:30 or so and put him to bed about 7:30 pm- and enjoyed the fact that he takes a mid-day nap- although sometimes it isn’t even long enough to write a blog! I share all of this to say to my friends who are currently grandparents, and to those who are anticipating this fun stage of life, because it’s important that you keep yourself physically able to participate in your grandchildren’s lives. Some of you have nieces and nephews and you are very involved in their lives. Same suggestion. To stay involved in their lives, keep yourself- or get yourself- into the best physical, mental and spiritual shape you can. The investment is real and could be costly. Choices are involved. But the dividends are tremendous. This week is about making memories that are bonding us for life. Rich dividends indeed! My choices for what to pull from the garden required little thought. We had deliberately planted the Black-eyed Susans and the grasses, so they got spared. The wildflowers and the morning glories had to go. They were all over the place! The morning glories were not too choosy, climbing on whatever might support them: the bird feeder stand, the tomato cage, sturdy weed stalks, bamboo stakes. A few weeding rules emerged: Find the base of the plant, then the root. Pull it out- gently, completely. Take as little soil as possible- leave it for the good plants. Get to the biggest plant: removing it will make the most visible difference and the progress will be encouraging. Do things orderly: you can’t tackle everything at one time. Don’t forget to step back and enjoy the progress! Set another goal. Work within a time limit. Get it done. As I was weeding, I continued to think about the process we have to go through to overcome bad habits in our own lives. For example, you can’t root out all of your bad habits at one time. My suggestion: take stock of what you are doing right. I kept the Black-eyed Susans and grasses, remember? So know what you are doing right, and keep it up! Tackle the habit or discipline that is the most out of alignment with your goals. Getting on track in this area could yield the fastest results- which would be encouraging, which would mean you keep doing it, which means you get more results. Now that would be a good cycle to be in! Early November is a great time to begin making significant changes in your daily lifestyle choices. We just had the time change; family’s activity schedules are changing so perhaps you can deliberately choose to write in regular personal activity; weather changes mean food changes, and fall and winter vegetables make excellent soups and provide variety to salads. Get a few good habits in place- see some results- before the holiday schedule totally takes over and sabotages your efforts for positive change! When you are committed to change, what works for you? Feel free to leave a comment.